Great run times, Guaranteed Tough durability and the compatibility with a widely accepted battery platform are just a few of the things that make the DEWALT Red Rotary Tough Laser a must have tool for your job site. 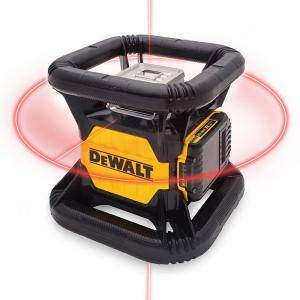 This Laser is ideal for Ideal for deck building, grading and foundations. This laser features scan mode of 15°/45°/90°. Tbook.com crawls the web to find the best prices and availability on Levels and related Tools and Hardware products like Dewalt 20-Volt MAX Lithium-Ion Red Rotary Tough Red Laser Level with Battery 2Ah, Charger and TSTAK Storage.... For this page, related items include products we find that match the following keywords: "Level" at our vendor partner Home Depot. Dewalt 20-Volt MAX Lithium-Ion Red Rotary Tough Red Laser Level with Battery 2Ah, Charger and TSTAK Storage... is one of 154 Levels and related products listed in the Tools and Hardware section of Tbook.com If you have any questions on this product, please give us a call at 734-971-1210 during the hours of 9am - 5pm EST for assistance. Thank you for shopping at Tbook.com, the Internet Department Store!